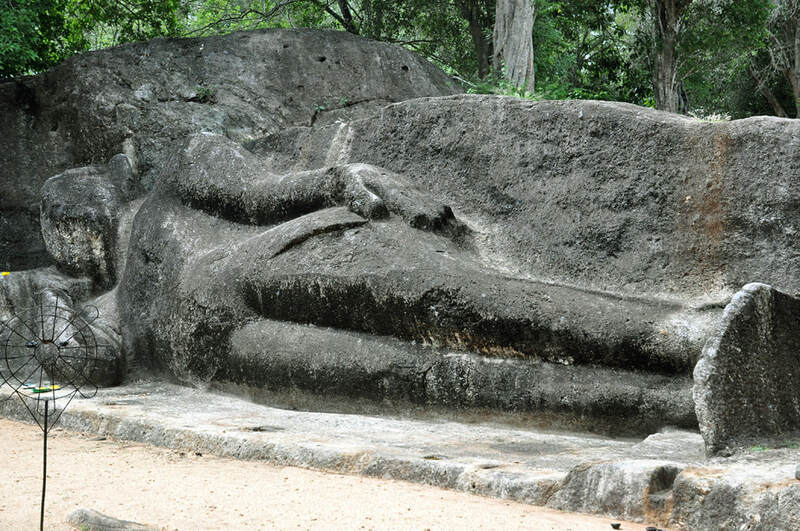 The less known rock-cut statue of the Buduruwayaya temple near Bakamuna is one of the three large reclining Buddhas from the Polonnaruwa period. This recumbant statue is known as Attaragollewa Buddha in scientific literature. The archeological site belonging to the Buduruwayaya Purana Viharaya lies 5 km to the southeast of Bakamuna, which in turn is situated 21 km to the southeast of Dambulla and 10 km north of Elahera. Elahera is famous for its ancient irrigation canal, dividing water from the Amban Ganga for the Minneriya reservoir. The Amban river anicut, where the canal branches off, is located only 1 km south of the Buduruwayaya temple. The reservoir and the Elahera canal, also known as Yoda Ela, are the masterpieces of the irrigation works of King Mahasena, who reigned in the late 3rd century. Several temples were constructed in the vicinity of the Elahera canal, for example a Bodhighara, a temple for tree-worship. Torsos of several Buddha statues were found at this Bodhigara near Bakamuna. To the west of Bakamuna, near a place called Maligatenna (not to be confused with the cave temple near Colombo), a bronze figure of Manjushri was excavated, a typical Mayana-Buddhist Bodhisattva. The main attraction of Bakuna, though rarely frequented by foreign travellers, is the rock-hewn Attaragollewa Buddha mentioned above. The name is also spelt Attaragollava. It is one of Sri Lanka’s three colossal Buddha statues in recling posture, the other ones being the famous recling Budhha of Gal Vihara in Polonnaruwa, part of the UNESCO World Heritage, and that of Tantirimale to the northwest of Anuradhapura. Apart from these three sculptures, there are many more reclining Buddhas in Sri Lanka, many of them at remote sites. But rock-cut reclining Buddhas are usually not of such a large size. And Sri Lanka’s other giant Buddha statues cut from rock surfaces are not in reclining position. Large reclining Buddhas from the Anuradhapura period are usually made of brick, for instance those of Pidurangala near Sigiriya and Habassa near Maligawila. Many reclining Buddhas from the Kandyan period are found in cave temples. 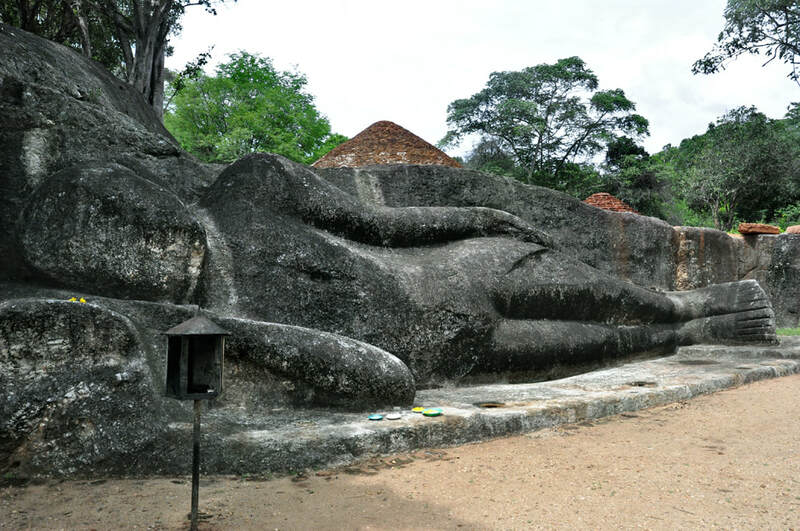 The huge reclining Buddhas of Polonnaruwa, Tantirimale and Bakamuna differ not only in one respect from those others. The three large rock-cut reclining Buddhas are Parinirvana-Buddhas, they depict the Buddha’s passing away, wherea most other recling Buddhas in Sri Lanka, particularly those from later periods, show him in sleeping position. The three rock-cut reclining Buddhas are therefore believed to be from the same period, the Polonnaruwa period, though this dating is not undisputed. The lack of inscriptions referring to the three statues is the reason why the styles would be clues allowing a dating. But the three statues differ in style, the recling Buddha of Polonnaruwa’s Gal Vihara is much more elaborate than the other two. The way of placing the head on the pillow is different, too. The reason to date all three of them to the same period is a hypothesis concerning the religious history of the island. The other huge rock-cut Buddhas are shown in standing posture. They assumed to be Mahayana-Buddhist works, showing superhuman beings. Their Mahayanistic character might be the reason why those impressive statues of Aukana, Sasseruwa or Buduruwagala are not mentioned in the ancient Buddhist chronicles, which otherwise mention every little work of Buddhist art. The largest Buddha statue, that of Buduruwagala, is flanked by other Buddhist sculptures that are Mahayanistic, beyond doubt. The Polonnaruwa period daw major reforms of the Buddhist order, the Sangha, particulalry initiated by the kings Vijayabahu in the second half of the 11th and Parakramabhu in the second half of the 12th century, the result of which wad the predominance of Theravada Buddhism. From the Polonnaruwa period onwards, the island’s Buddhism was exclusively Theravada, integrating some Mahayana elements, whereas Mahayana and Theravada existed side by side during the earlier period of the Anuradhapura kingdom. In contrast to the huge rock-cut Buddhas from the Anuradhapura period, the even huge rock-hewn Buddhas of the Polonnaruwa period can not depict Mahayana figures any more. This could explain, why the giant Buddhas from the Anuradhapura period are standing and those in reclining position are from the Polonnaruwa period. The latter are not superhuman any more, they depict the moment of the passing-away of a purely human being, a key event in the story of the historical Buddha Shakyamuni. This emphasis is more in line with Theravada teachings, which stresses the significance of salvation of human beings, the final event of which is the Parinirvana, while the Mahayana stresses the significance of supernatural saviours who surpass ordinary human beings, helping them on their way to salvation. In Mahayana Buddhism, those higher beings particularly delay voluntarily the moment of their Parinirvana, because Parinirvana, which includes passing-away, would bring their healing and saving powers to an end. In a sense, stressing the importance of Parinirvana in creating monumental statues depicting just this event, is an antithesis to Mahayana teachings and therefore the perfect way to illustrate the reformed and restored Theravada religion of the Polonnaruwa period. Of Sri Lanka’s three giant Buddhas that are carved from rocks, the Attaragollewa Buddha of Bakamuna is the smallest one. It measures 12 meters inlength. It’s also the most weathered of the three statues.